Musicafied, Mollified, or Muellerfried? Your choice, with artsy options, within. April 19 2019 edition. Note: MANY MORE photos and illustrations added to the stories since this was originally published on Friday, April 19th. * LATE ADDITION: understanding what happened in SRI LANKA in the Easter massacre, and not jumping to conclusions. (See the last item, added in the bottomost feature, "ODDS n' ENDS, STRAYS HERDED FROM THE HOLLAR, 'n UNMASKED REDACTIONS." It's Easter. 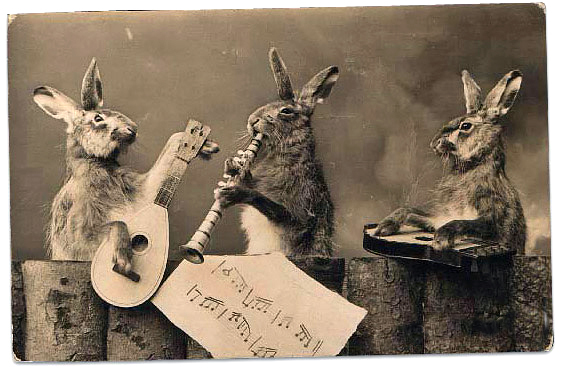 Every bunny wants to get into the act. 6) "WHEN THERE'S NOTHING YOU CAN DO... YOU STAND IN SOLIDARITY AND SING"
13) WHAT'S IN THAT REESE'S EGG? 15) ARTISTS: YOUR INNOVATIVE IDEAS ARE NEEDED FOR "SPACE FOR THE OCEANS"
19) WHAT WILL IT TAKE TO WIN THE DEMOCRATIC NOMINATION? But this IS too much for one basket. Everything ABOVE is here, in the NEWS edition. Stay here for the NEWS edition. Go there for the EVENTS edition. Merriam-Webster, the dictionary people, tell us, "Mollify, pacify, appease, and placate all mean 'to ease the anger or disturbance of,' although each implies a slightly different way of pouring oil on troubled waters." The oil on those waters is about to burn. Our advice is, everybody outta the pool. Go find some rejuvenating tuneage. ARE STILL TALKING ABOUT NOTHING ELSE. "He isn't guilty of obstructing justice only because nobody followed his orders." DO YOU WANT TO READ THE FULL (REDACTED) MUELLER REPORT? defense attorney for the occupant of the White House (and more often, the golf course). 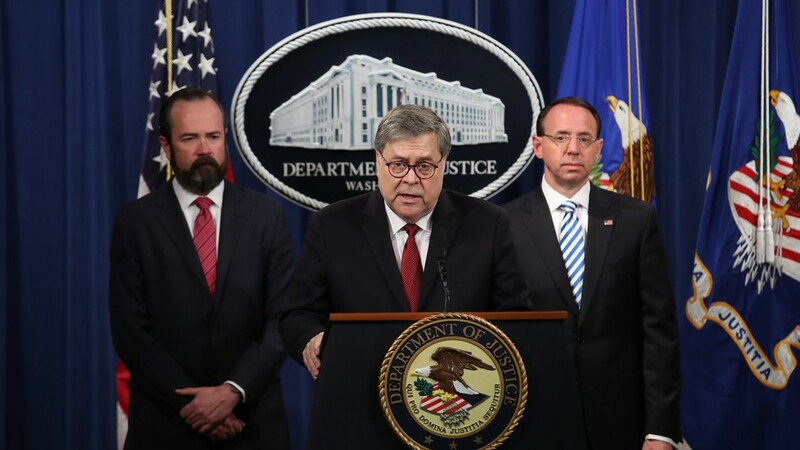 Most fun of all was had with Deputy AG Rosenstein's "hostage stare," and "the bearded guy who looked like a Confederate general." The resulting explosion destroyed the Alfred P. Murrah Federal Building. It killed 168 people, including babies in a day care center, and injured 675 others, some crippled for life. 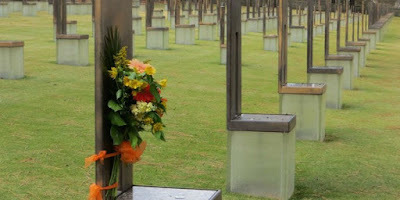 chair bears the name of one of the 168 people killed by the bombing. 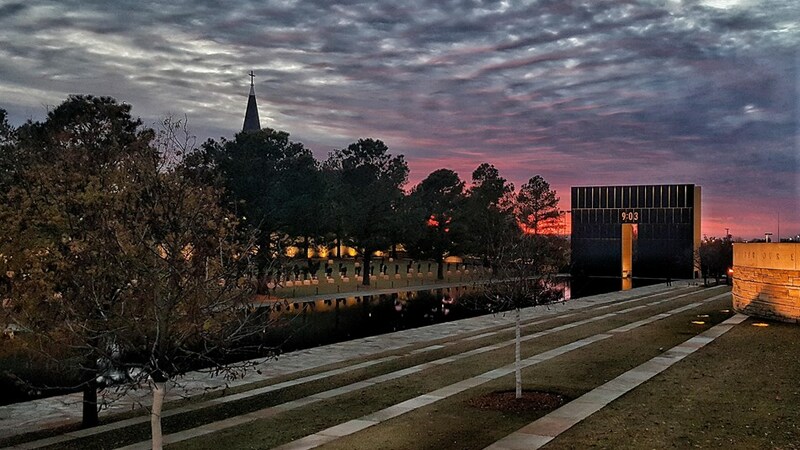 Drawing upon a massive news archive of the events, including more than 60 hours of audio from jailhouse interviews with the bomber, the award-winning PBS "American Experience" documentary "Oklahoma City" traces the events that led the bomber to his murderous act on that day. It recounts the stories of survivors, first responders, U.S. Marshals, FBI investigators, and journalists who covered the attack. Click either image to enlarge it. "Oklahoma City" is available on iTunes, Netflix, Amazon Prime and Google Play, and those who have bought the "PBS Passport" already know how to watch it free. For some inscrutable reason, corporate media and politicians collude in a conspiracy of denial that forbids labelling these acts as terrorism. Perhaps that's because the warconomy needs that word to justify ever-more replacement of diplomacy with military-backed regime change -- to export shockingly violent acts to other people's countries. And to employ a standard response of "praying for the victims" instead of finding ways to end domestic terrorism -- especially when assault weapons are involved. A common factor in the marked rise of violence -- along with America's adduction to owning military combat weapons and failing to treat what combat does to our veterans -- is another factor. It's one that's emphasized in a new documentary film, this one a short. 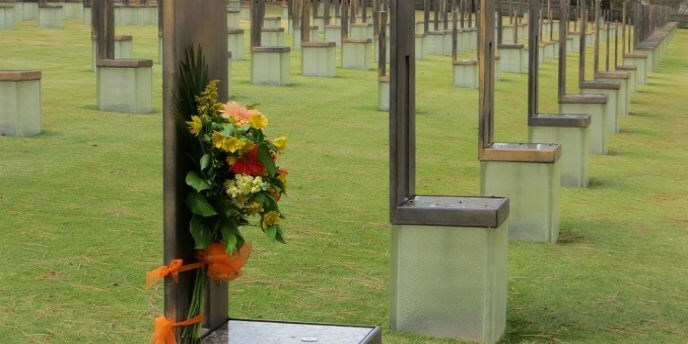 It focuses on the literature and ideas of the radical right that motivated the Oklahoma City bomber, and continues to manifest in violent and murderous acts that never seem to be called terrorism. And yes, Saturday marks the 20th anniversary of the massacre at Columbine High School in Colorado. Mainstream media appears to be focused on that, but not on Oklahoma City. So we chose the latter. This is in the events calendar, but we didn't want you to miss it. Here's a copy with prominent placement. 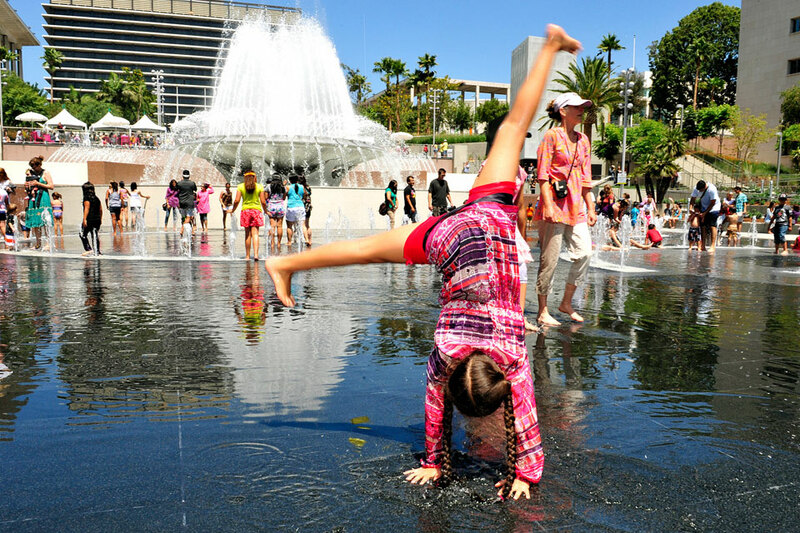 Noon-1:30 pm - "OUR L.A. VOICES" presents FREE "LUNCHTIME WORKSHOPS," Grand Park's prelude event for "Artists & Aspiring Artists" before the 2nd annual "OUR L.A. VOICES: A POP-UP ARTS+CULTURE FEST," happening Apr 27 & 28, 11 am-5 pm, and also FREE. * REGISTER FREE, in advance, for any of these free weekday opportunities, using the individual link for each. * You can also ride the Red/Purple line subways to Civic Center/Grand Park Station if that works better for you (during EARTH WEEK, hint-hint). * ALL WORKSHOPS ARE FREE and include validated (free) parking (see above) but don't dawdle -- get registered before they fill-up! "How to Become a Social Media Ninja in Under an Hour" with Rick Ruskin, available now. The Indie Contact Newsletter / Indie Bible publishing folks up in Ottawa have an offer for musicians that comes with a kick in the pants. They begin by asking, "Are you prepared to be put in your place (in an eye-opening, 'I needed to hear this' kind of way)?" Of course, that question is purposeful. And part of the kick in the pants is, you must act PROMPTLY to get your access pass, good for only 48 hours from the moment you click the link. That'll get you free access for 48 hours to the online session with RICK BARKER, the manager of artists who have included TAYLOR SWIFT. "Just a head's up... Your ticket allows you to watch this training for 2 days ONLY! "So be sure to catch his training now! 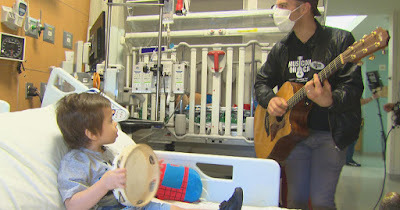 "If he can help hundreds of indie artists around the world, he can help you too..."
The organization's volunteer musicians have performed for more than 700,000 individuals -- patients, families and caregivers -- at hospital besides and in healthcare facilities ranging from children's hospitals to adult facilities, VA hospitals, and hospices, nationwide. 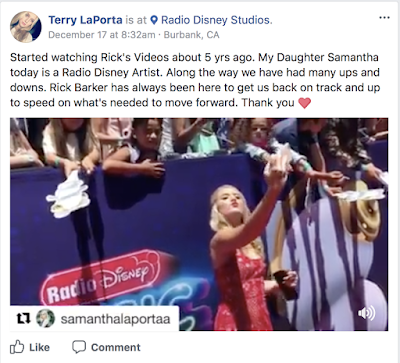 Major artists including Bruce Springsteen, Kelly Clarkson, Luke Bryan, Keith Urban, Lady Antebellum, Justin Timberlake, Ed Sheeran, Reba McEntire, Gavin DeGraw, Darius Rucker, Pharrell, Amos Lee, Nick Jonas, Rachel Platten and many more have all supported Musicians On Call. "Musicians on Call" (MOC) is an exemplary nonprofit that brings live and recorded music to the bedsides of patients in healthcare facilities. 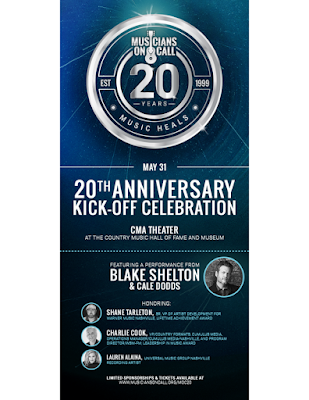 Looking forward as well as back, it's hosting a 20th Anniversary Kick-Off Celebration in Nashville on Friday, May 31 at the CMA Theater. 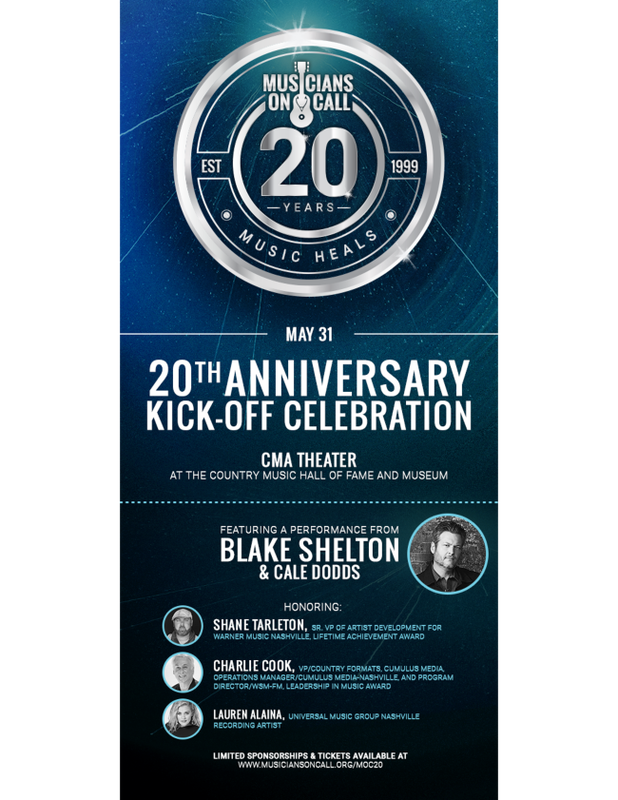 The event will celebrate the organization's two decades of delivering the healing power of music NATIONWIDE and the event will feature a headlining performance by Warner Music Nashville star Blake Shelton, plus an opening set from label mate Cale Dodds. The nonprofit will present its first "Lifetime Achievement Award," together with "Leadership In Music Award" and "Music Heals Award" at special celebration event at the CMA Theater in Nashville. SHANE TARLETON, longtime MOC supporter and SVP of Artist Development for Warner Music Nashville, will be recognized as the organization's first "Lifetime Achievement Award" recipient at the event for his decade-long support of MOC as an Advisory Board Member. Shane is being recognized for his commitment to music and health causes throughout Nashville, including his volunteer service with Musicians On Call at Alive Hospice and Monroe Carell Jr. Children's Hospital at Vanderbilt. CHARLIE COOK, VP/Country Formats, Cumulus Media, Operations Manager/Cumulus Media-Nashville, and Program Director/WSM-FM, will receive the "Leadership in Music Golden Ukulele" in gratitude for the support Cumulus and Nash FM has given to MOC. LAUREN ALAINA, Universal Music Group Nashville recording artist, will receive the "Music Heals Award" thanks to her commitment to volunteering at Musicians On Call's "Bedside Performance Program." The celebration will begin with an exclusive VIP reception at the CMA Theater, followed by performances by Dodds and a full-band set from Shelton. 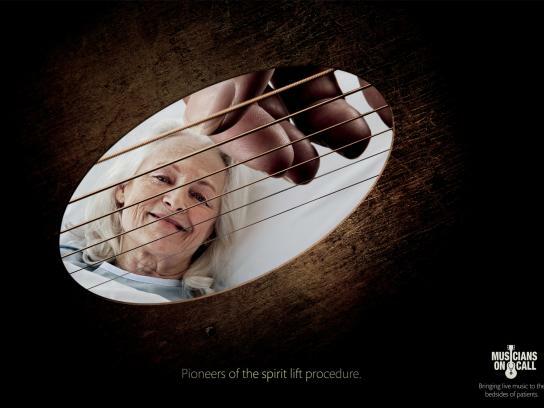 "Over the past 20 years we've brought the healing power of music to over 700,000 people in hospitals nationwide. A single song has the ability to lift a patient's spirit unlike anything else and science has proven that music does actually help patients heal," said Musicians On Call President & CEO Pete Griffin. He continued, "It's been an honor to bring this experience to facilities nationwide and we could not have done it without the support of our community, volunteers and artists who generously give their time and talents to brighten someone's day, especially champions like Shane Tarleton, Charlie Cook and Lauren Alaina. What better way to celebrate this milestone than with music icon, Blake Shelton!" The Musicians on Call 20th Anniversary Kickoff Celebration is sponsored by City National Bank, Outback Presents, Warner Music Nashville, OnSite, HCA, RIAA, UMG Nashville, YouTube, Cumulus Media and John and Stephanie Roberts. Musicians On Call will also host special celebratory events coast-to-coast, starting with the kick-off concert in Nashville. This fall, MOC will honor its founders and many supporters from throughout its 20 years at a gala celebration in New York City. Leading up to the gala celebration, MOC will host celebrity hospital visits, a 20th anniversary auction, social challenge and its first-ever 20-day fundraising challenge. Throughout the year, MOC will be posting its favorite "MOC Moments" using #MOC20 and encourages supporters to post their favorites as well. MOC began with its first "Bedside Performance Program" in New York in 1999, co-founded by music industry entrepreneurs Michael Solomon and Vivek Tiwary, and has since expanded across the country with programs in 20 major markets. MOC's "Bedside Performance Program" first came to Nashville in 2007. Since then, it has performed for more than 155,000 individuals in local hospitals. Through live, in-room performances for patients who are undergoing treatment or unable to leave their beds, MOC's volunteer artists add a dose of joy to life in a healthcare facility. "WHEN THERE'S NOTHING YOU CAN DO... YOU STAND IN SOLIDARITY AND SING"
As the singing continued, instrumentalists joined the gathering. 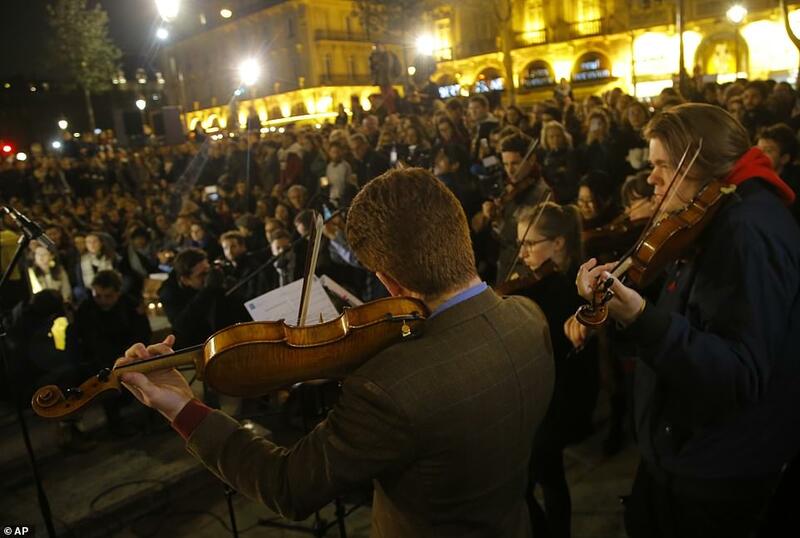 Shocked Parisians and tourists found comfort and camaraderie. Here, we want to reprint a tiny portion of that coverage. It's the part about the healing power of music -- and that makes it something for every time and circumstance. Here it is. Dan Rather wrote on Twitter, "Why has the burning of Notre Dame moved so many? Because we believe in beauty, majesty, faith, art, history, and the human expressions thereof. We recognize in this cathedral our common humanity. A scar now emerges in our connections to our past, our future, and each other." A group of Parisians sang hymns in French as they watched the 800-year-old Notre Dame cathedral burning in the distance, and, as "The Daily Good" notes, "it is tragically beautiful." They conclude, "When there's nothing you can do but watch something beautiful burn, you stand in solidarity and sing. It's what humans do and have always done. "Hearts all over the world are with you, Paris. 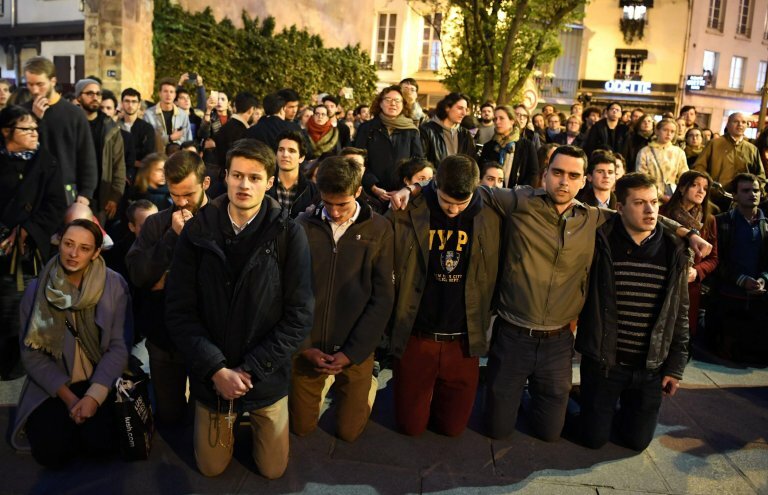 Vive la Notre Dame." 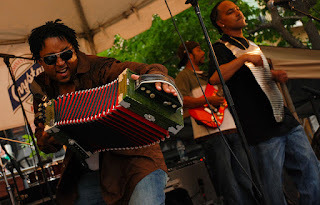 ZYDECO BRAD, recently retired editor of the monthly Cajun-zydeco performance calendar and news, sent us links for his extensive YouTube Channel. It contains some of his favorite Cajun and Zydeco live music performance / dance videos. Check them out! If you're into dancing, you'll find some new moves. 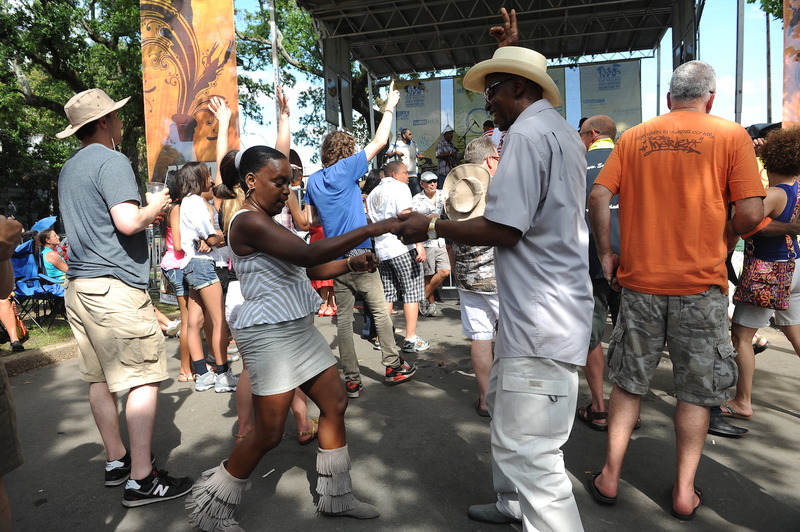 If you're not a dancer, have fun exploring the tuneage. 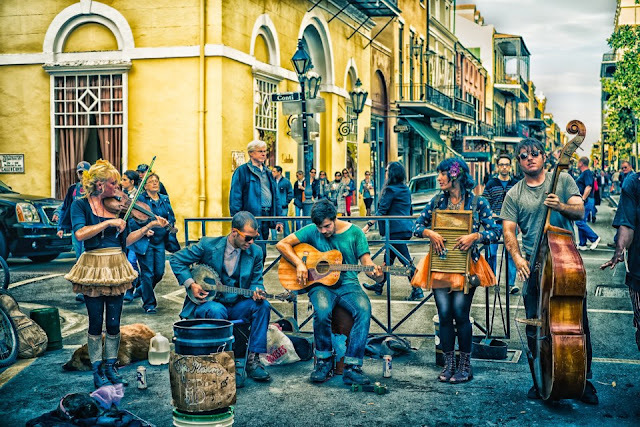 You'll see who does what with the fiddle, accordion, rubboard and whatever else, and enjoy the scenes of bunches of Louisiana-based bands in action. The main link to Brad's YouTube channel is at the bottom, if you want to bookmark it to gradually work your way through the collection. Otherwise, each listing is a separate performance. Something of a grab bag of links without knowing the band until you get there, but that makes it more fun! The 28th annual "South Bay's Best" sponsored by the Daily Breeze newspaper lets you vote for places there and performers you know who are based there. Voting is underway in the Daily Breeze recognitions. After you verify your email address, you'll have your choice of several categories. Key among them, you can choose "Places" from the list of categories. On one track there, scroll down to "Night Spot/Live Entertainment." There, you might want to type-in "Grand Annex" or "Alvas Showroom" or one of the area's performing arts centers or a favorite haunt with fine tuneage. Under the same category of "Places," you can also take another track and scroll down to "Performance Venues." There, think about places where you've enjoyed live music, musical theatre, stage plays, or whatever you're into. For example, you may want to type-in "Warner Grand Theatre," or "Torrance Performing Arts Center," or "Alvas Showroom," or any of many others you prefer. Think broadly for both categories. "Night Spot/Live Entertainment" and "Performance Venues" can sometimes be played either way. Irish pubs with live music are easy to find in that region, so consider where you've enjoyed a pint and tuneage. Eateries include places like Redondo Beach's Ragin Cajun, which presents live Cajun-zydeco and even an annual festival, and they do catering. (They won Easy Reader's "Best Cajun Restaurant" in "Best of the Beach.") And there's San Pedro's Whale & Ale restaurant, a longtime live music venue. Or maybe you'd rather vote for the latter in the "Night Spot/Live Entertainment" category. Fans of Andy & Renee and their full band, Hard Rain (repeat winners of Easy Reader's "Best Local Band" in "Best of the Beach," and sponsors of the superb annual "Dylanfest" in Torrance, in the South Bay) may want to reward the places they perform with votes for "their" venues. When voting for artists in these Daily Breeze honors, you'll need to click the "Write-in" tab, and vote in the "People" box. We just suggested one option, and you should remember that genuine blues legend Bernie Pearl lives in Long Beach, and blues/jazz vocalist and icon Barbara Morrison performs in her own theatre (and presents a spectrum of shows) in the South Bay. The "Events" tab lets you type-in a festival in that part o' the whirled. "Places" allowed us to type-in the Battleship Iowa in San Pedro, with its ever-better museum program and very dedicated volunteer crew. The Liberty Ship S.S. Jeremiah O'Brien, a museum that still puts to sea, also qualifies. So does the Pt. Fermin Lighthouse Park, or Ports O' Call Village. But you only get to name one. Beyond that, you're on your own. But DO vote, and remember, you need to have the names on hand to type-in for at least ten items. The South Bay is rich in arts and music venues and artists, and good eats, and there are plenty that deserve new or continued recognition to keep on keepin' on! We take an activism-oriented approach here. There are things YOU can do! Of course there are MANY more things to do than the ones we present here with links to follow and petitions to sign -- plus places to meet like-minded folks, over in our EVENTS listings. MONDAY IS EARTH DAY. (Every day needs to be Earth Day, if we want planetary survival of the biodiversity necessary to assure OUR future!) See the history -- who started it -- in Monday's EVENTS. Wednesday is the release of the "STATE OF THE AIR REPORT" from the American Lung Association. Any bets Big Media covers it? Okay, so it's a link, not a feature story. Unless you click the link. There, you'll find all kinds of practical tips for saving energy and avoiding making as a big a toxic trail as most people do. 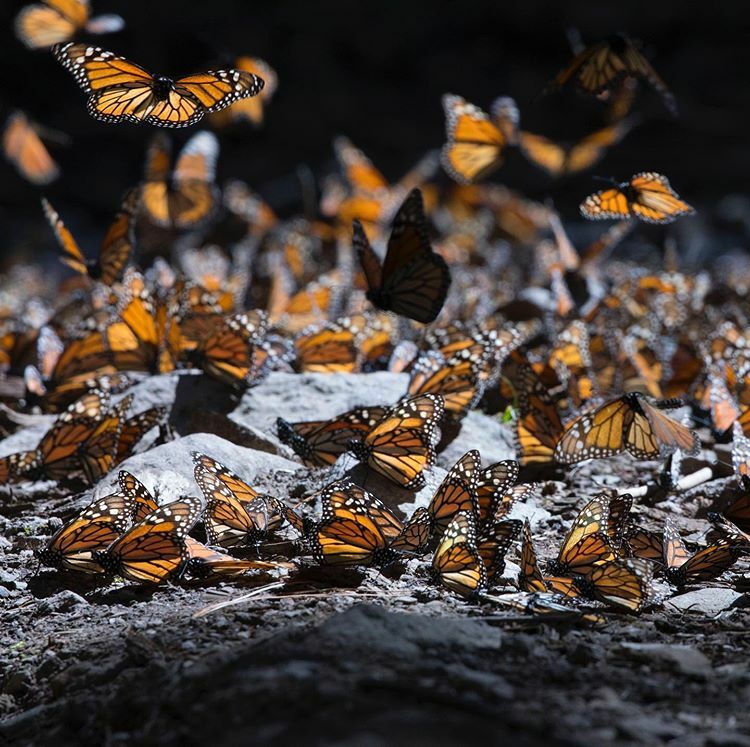 The Monarch Butterfly population has suddenly surged by 144%. But years of decline mean they're still in trouble. On Saturday, April 20, "National Park Week 2019" kicks off with a fee-free day. ALL national parks will waive their entrance fees on that one day, so GO, already! This year, April 20 through 28, national parks across the country celebrate "National Park Week 2019" with a variety of special events. There’s no better time to #FindYourPark / #EncuentraTuParque or to learn about the incredible resources and histories preserved in these special places. FREE "NATIONAL PARK OWNER'S GUIDES." These 11 FREE DOWNLOADS (plus waay MORE clickable resources) are filled with travel tips and information on what not to miss. There are separate guides for everything from hiking to going green and riding the train to get to the park you want to visit. 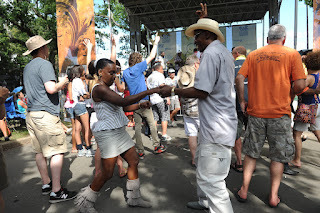 Plus bunches of topics in "TRAVEL IDEAS FROM THE BLOG." Sadly, the Democratic Party Establishment pays lip service, but won't get serious. Would you believe the Democratic National Committee does not want to hold a 2020 presidential primary debate focused on climate change? They have absolutely no plan or intention of doing that, even though the Dem presidential candidates WANT it. So, once again, It's up to "we, the people" to force the Political Establishment to act. The Guide's editor has sent letters to the leaders of the Democratic Party about their failure to support a meaningful "Green New Deal." We have called them out for their repeated failures to support the pro-environment, pro-species-survival efforts of individual office holders from their own party. Our message? "You may be sincere in your advocacy for a plethora of actions across a spectrum of issues. 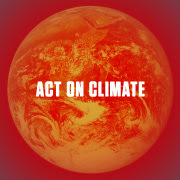 But unless you take immediate and effective action to reverse climate change, everything else you do is re-arranging deck chairs on the Titanic." You can sign the new petition calling on the DNC to hold a 2020 presidential primary debate FOCUSED ON CLIMATE CHANGE. We have signed and support it. Will you join us? 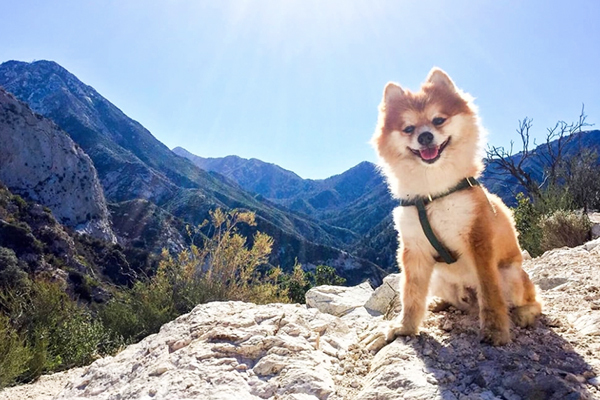 The folks at "Do L.A." just published their choices for favorite trails, noting that wildflower blooms, Earth Day, and Earth Month, combine to make it the best time to explore the great outdoors. Since we've always headed for the high country of the Sierra or the high San Gabriels, we enjoyed seeing that their list has lots of places much closer to urban centers, including places we've yet to go. We'll add that you need to watch for snakes, and if you're camping overnight, you need a bear barrel for your food and anything that smells sweet, like toothpaste, deodorant, and lip balm. WHAT'S IN THAT REESE'S EGG? "Fact is, way more chocolate and candy is sold for Easter than for Halloween! And that means more rainforest and habitat is destroyed to make ‘em." When I was a kid, my parents didn’t have to worry about palm oil from rainforest destruction. 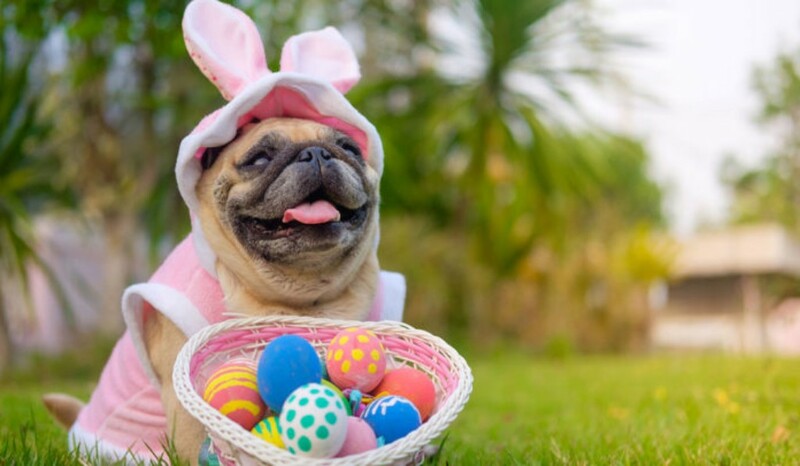 We dyed eggs the night before Easter and woke up the next morning to baskets filled with fake grass, jelly beans, and the real prize, what my folks called “a little something” — some silly putty, superballs or crayons. Ugh FINE! THERE’S PALM OIL IN CHOCOLATE AND CANDY! CONFLICT PALM OIL, FUELED BY RAINFOREST DESTRUCTION. There, I said it. 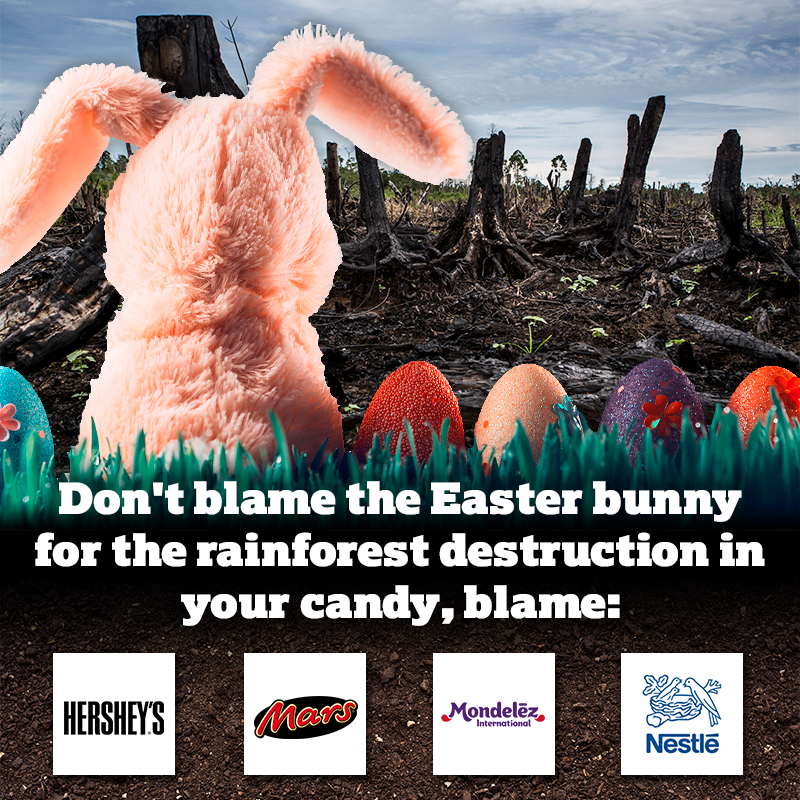 Candymakers Nestlé, Mars, Mondelēz and Hershey’s made a commitment to end rainforest destruction, but they aren’t doing a good job of monitoring deforestation to keep Conflict Palm Oil out of their treats. For years, RAN [Rainforest Action Network] and our partners have been monitoring candymakers’ supply chains in Indonesia’s endangered Leuser Ecosystem — a region so critical that we’ve been monitoring the implementation of palm oil commitments and using satellite imagery to track where forests are burned or bulldozed. But that should NOT be our job — it’s up to these international corporations, making billions in profits, to track where rainforest destruction is taking place so they can stop it and keep it out of our treats. Fact is, way more chocolate and candy is sold for Easter than for Halloween! And that means more rainforest and habitat is destroyed to make ‘em. Once again now: candymakers make billions and billions of dollars in profits. It’s their responsibility to know what’s happening to forests and to STOP the destruction for Conflict Palm Oil! Chelsea Matthews, who signs, "In solidarity with rainforest-loving peeps everywhere," is a Forest Campaigner at Rainforest Action Network in San Francisco. Rain forest destruction is a key driver of climate change. Politicians and corporatists talk of taking bold action on a spectrum of problems, but... The fact is, unless climate change is REVERSED, anything else we do is re-arranging deck chairs on the Titanic. 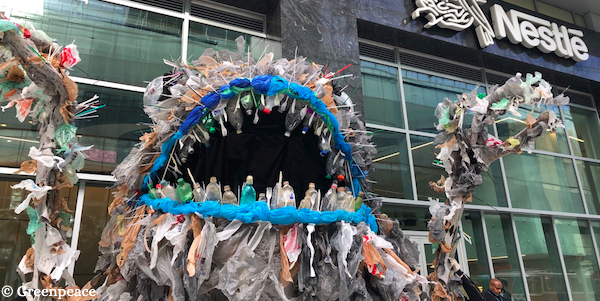 Plastic monster, made entirely of trash floating in the ocean. In 2018 alone, Nestlé was responsible for creating nearly 4 billion pounds of single-use plastic packaging that in many cases is not recyclable or reusable — instead it will end up as waste forever haunting our planet! We need to strike while the iron is hot. Will you help us tell Nestlé how dire the plastic pollution crisis truly is? Call Nestlé right this moment at 1-888-918-6672 and tell them they must phase out their reliance on single-use plastic packaging, and move to refillable and reusable options. I cannot bear to see another headline about communities overrun by the global waste trade – or another dead whale with a gut full of plastic. So my friends and I called out Nestlé at its office with a giant monster made with discarded Nestlé packaging. If you feel like I do, please join us by calling out Nestlé over the phones. "Hi, my name is __________ and I’m calling from (your CITY & STATE). I’m very concerned by the massive amount of single-use plastic pollution and Nestlé is one of the largest global corporations that relies heavily on such packaging. I would like Nestlé to be an industry leader and phase out single-use plastic, while innovating bold, new solutions like refillable and reusable packaging. Thank you!" You can also send a message demanding an end to single-use plastic on Nestle's Facebook. Not on Facebook? No problem, you can send a message on Instagram or Twitter. Nestlé needs to hear from you right now. You’ve already joined millions signing petitions demanding an end to its single-use plastic and spreading the word on social media. They know they’ve created a problem, but they don’t want to be the ones to solve it. The solution, however, is in their hands, and the time is now. Nestlé must make the switch to systems of reuse. Editor's note: of course, it's not just one company. EVERY MINUTE (of every hour, every day), a monster-sized load of plastic — the equivalent of a truckload — enters the ocean. For a global map of plastic in the oceans, see the next feature. ARTISTS: YOUR INNOVATIVE IDEAS ARE NEEDED FOR "SPACE FOR THE OCEANS"
ESA -- the European Space Agency -- wants your ideas for applying space technology to Earth-based problems. Really and truly, they do. Pause a second and think: who, among our blue planet's infestation of human presence, is more passionately creative than our artists? See why they're asking You? History provides plenty of examples of artists with bold ideas that revolutionize everything, and collaborations (intentional or not) that allow designers, engineers, and scientists to use ideas that were hatched in the minds of artists. Quick example: comedian Steve Allen developed the design concept for the first artificial heart. Astrophysicist Neil de Grasse Tyson has said, "Science without art doesn't mean anything, and therefore cannot sustain the motivation to go on. 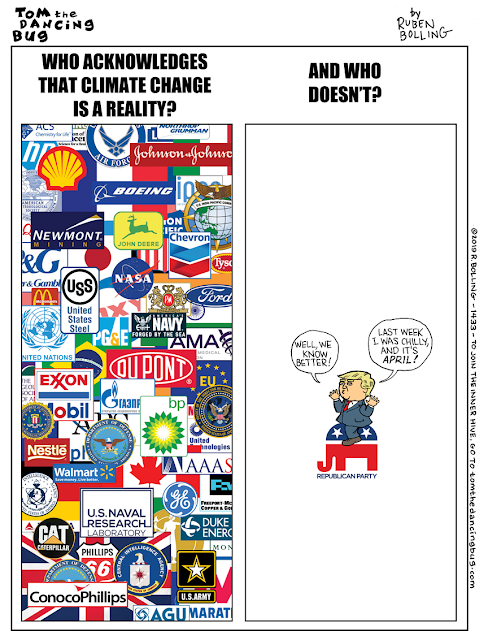 The artist who cares about science is essential to everything." (2) to improve the self-steering abilities of ships. With about ten million metric tonnes of plastic entering the ocean each year. Wildlife and ecosystems are suffering. And the economic impact on coastal communities, tourism and fisheries, is huge. Monitoring this plastic is incredibly difficult from Earth’s surface, as it’s impossible to see a lot of the ocean at once. Space represents a more promising vantage point; but satellites cannot detect plastic marine litter - at least, not yet. 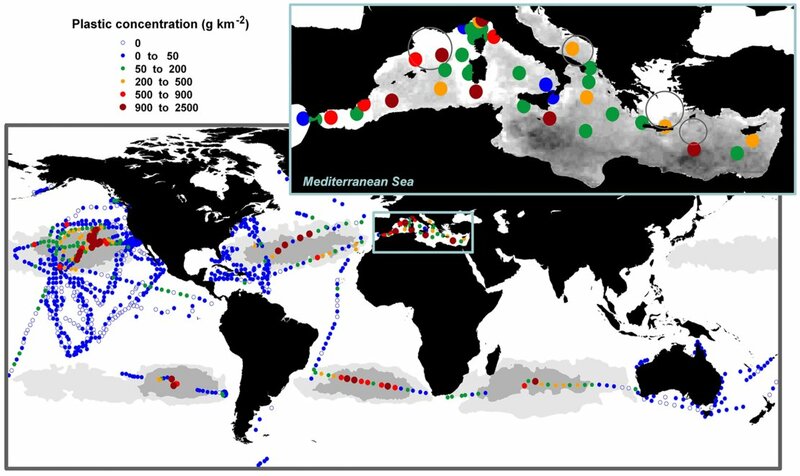 Plastic litter in global oceans. Click to enlarge. Solutions to plastic litter could include measuring plastic concentrations, identifying how the litter is transported around the world, and identifying sources and sinks of plastic marine litter. ESA welcomes innovative ideas that support the detection and monitoring of different types of plastic, both for the oceans and freshwater systems. 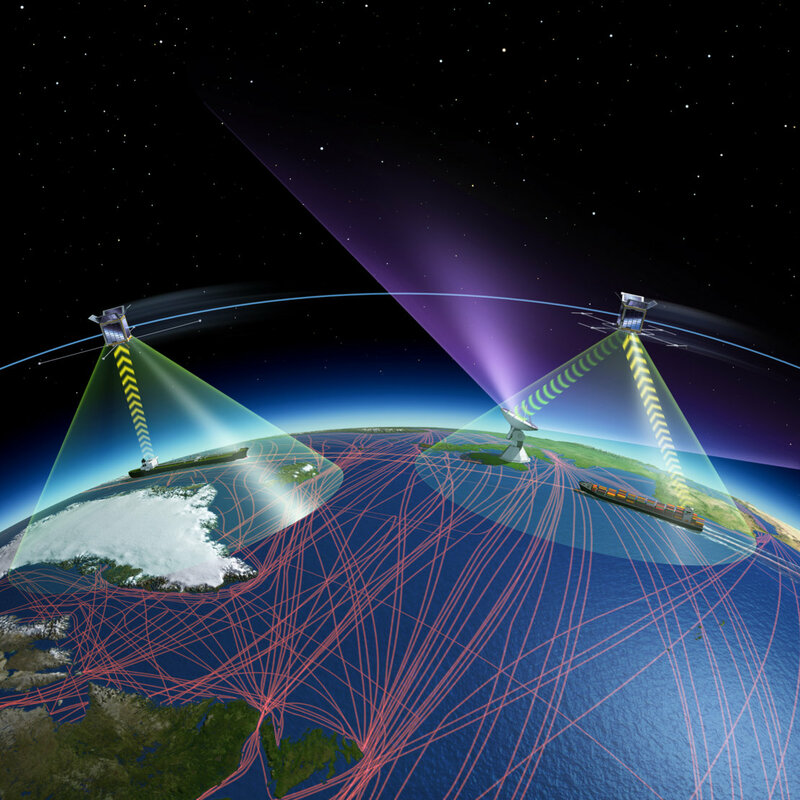 ESA is also seeking ideas that would contribute to enabling the increased adoption of autonomous shipping. This could significantly lower shipping costs, increase safety, solve anticipated crew shortages, and improve working conditions. Autonomous shipping supported from space. Navigation satellites are only visible at low inclinations in high polar regions, and their signals can be disrupted by interference from the ionosphere, the electrically active segment of the atmosphere – the same phenomenon that creates the Northern Lights. A variety of options exist for improving current techniques, including combining satellite data with terrestrial data to ensure worldwide coverage, and developing new satellite networks that can provide more accurate and guaranteed positioning. Furthermore autonomous shipping could be revolutionised with new systems designed specifically to monitor harbours, and through combining different systems using artificial intelligence. Image: How to use ideas.esa.int. Click to enlarge. 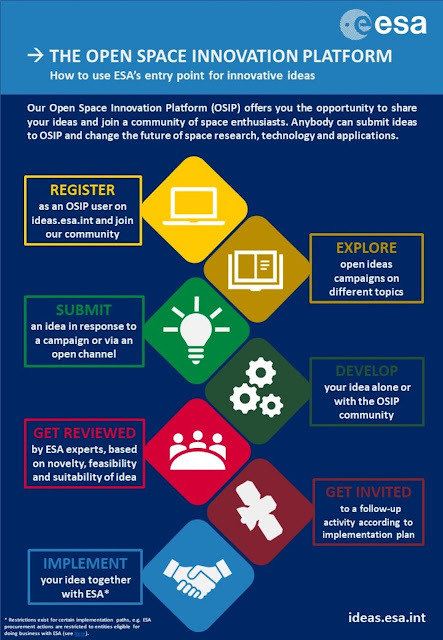 OSIP -- the Open Space Innovation Platform -- is run through ESA's Discovery & Preparation program, which forms part of ESA’s Basic Activities. Working with and across all ESA programs, Discovery & Preparation lays the groundwork for ESA’s short- to medium-term future activities. “Via OSIP, we are addressing the most relevant challenges in space, and enabling parnters to work with ESA on activities that seek the best solutions,” concludes Ian Carnelli, Manager of ESA’s Discovery & Preparation activities. Really, check it out. We know an artist who, as an 11-year-old, invented the Auto Train concept years before the business world thought it up and built it. He was doing it with his American Flyer. Leonardo DaVinci is remembered by history as a great innovator and inventor. In his time, he was regarded as an artist -- a great artist, but an artist -- not an inventor, and few of his inventions were built until hundreds of years after he was dead. Do you want to be a DaVinci after you're gone, or now? Your ideas may change the world. Get started. What are you waiting for? This incredible image of the hourglass-shaped Southern Crab Nebula was taken to mark the Hubble Space Telescope’s 29th anniversary in space. Each year the telescope dedicates a small portion of its precious observing time to take a special anniversary image, focused on capturing particularly beautiful and meaningful objects. Launched April 24, 1990 from the space shuttle Discovery, the orbiting reflecting telescope was initially useless because of a minor, but crucial, flaw in its huge mirror. Another space shuttle mission had to do something that was never thought possible: partial disassembly of the telescope by spacewalking astronauts. They placed an array of tiny corrective mirrors inside Hubble that functioned like a person being fitted with vision-correcting glasses. And additional shuttle missions performed challenging and unprecedented tasks to extend its capabilities, as well. Hubble has since revolutionized how astronomers and the general public see the Universe. The images Hubble provides are spectacular from both a scientific and a purely aesthetic point of view. This new image adds a lot of science and changes our understanding of the nebula, even as it demonstrates the telescope’s continued capabilities. This peculiar nebula is one of the many objects that Hubble has demystified throughout its productive life. This, the Southern Crab Nebula, is so named to distinguish it from the better-known Crab Nebula, a supernova remnant visible in the constellation of Taurus. The image reveals active, dynamic processes. It shows nested, hourglass-shaped, structures created by the interaction between a pair of stars -- a binary star system -- at its center. The pair of stars is unequal and constantly changing. They are a red giant and a white dwarf. The red giant is shedding its outer layers in the last phase of its life before it, too, lives out its final years as a white dwarf. Some of the red giant's ejected material is attracted by the gravity of its companion. When enough of this cast-off material is pulled onto the white dwarf, it also ejects the material outwards in an eruption, creating the structures we see in the nebula. Eventually, the red giant will finish throwing-off its outer layers and stop feeding its white dwarf companion. Prior to this, there may also be more eruptions, creating even more intricate structures. But... Astronomers did not always know this. The object was first written about in 1967, but was assumed to be an ordinary star. That was until 1989, when it was observed using telescopes at the European Southern Observatory's La Silla Observatory. An image taken then showed a roughly crab-shaped extended nebula, formed by symmetrical bubbles of gas and dust. These observations only showed the outer hourglass emanating from a bright central region that could not be clearly resolved. 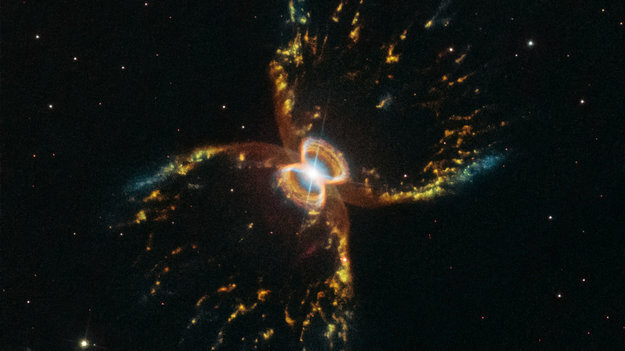 It was not until Hubble observed the Southern Crab in 1999 that the entire structure came into view. That image revealed the inner nested structures, suggesting that the phenomenon that created the outer bubbles had occurred twice in the (astronomically) recent past. It is fitting that Hubble has returned to this object twenty years after its first observation. This new image adds to the story of an active and evolving object and contributes to the story of Hubble's role in our evolving understanding of the Universe. We noted that several space shuttle missions were tasked to perform rebuilds and maintenance that have kept Hubble functioning far beyond its designed lifetime. Sadly, with no similar manned space capabilities since abandonment of the shuttle program, Hubble's days are numbered, since no further maintenance can be performed. And we are sticking with activism-oriented news. "In a democracy, people need to know if their government is interfering and subverting democracies and committing war crimes overseas. 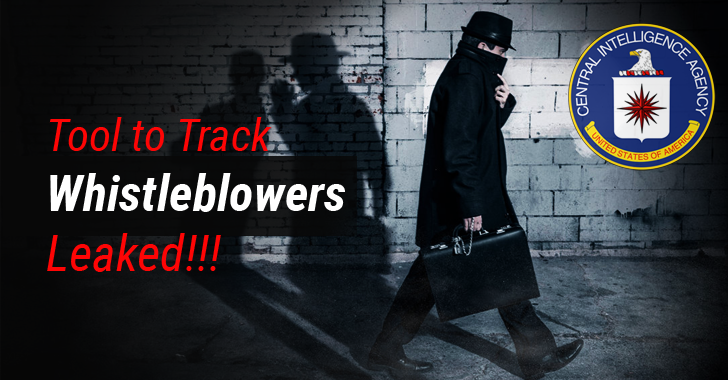 In a democracy, our courts should be busy prosecuting crimes EXPOSED by WikiLeaks, instead of turning the act of revealing them into some sort of crime to persecute and incarcerate the whistle-blower." Press freedom isn't just for the easy cases. Let's look at the largely unreported facts, then we hope you'll want to join us in telling the UK not to extradite Julian Assange. "Personal likeability should not be allowed to cloud a matter of such importance in principle. The alleged offense is of such a trivial nature as to make absurd any claim for extradition." -- comment from a supporter. and the current president has sworn a vendetta against "leakers." The U.S. government will argue in a London court that the United Kingdom should extradite WikiLeaks' Julian Assange to the United States to stand trial. The Guide stands against corporate celebrity talking heads who seem fine with that, and we join WITH every major press freedom organization, to urge the UK: DO NOT extradite Assange, but free him. coups, interfering in foreign elections, and "regime change." "This is the first indictment of a journalist and editor or publisher... And if it’s successful it will not be the last. This is clearly a part of President Trump’s war on the press, what he calls the enemy of the state." "Several parts of the indictment describe very common journalistic behavior, like using cloud storage or knowingly receiving classified information or redacting identifying information about a source." "For years, the Obama administration considered indicting WikiLeaks publisher Julian Assange, before rightly concluding it could not do so without encroaching on core press freedoms. Now almost nine years in, the Trump administration has used the same information to manufacture a flimsy and pretextual indictment involving a 'conspiracy' to violate the Computer Fraud and Abuse Act — based entirely on alleged conversations between a journalist and source." But... many prominent figures in the U.S. media, cheering Assange's arrest, display more loyalty to the U.S. government than to journalism or publishing. We must step-up in their absence and defend their institution. We ask that you, as someone who values REAL news and what it takes to research, verify, and present it in the face of powerful interests who want it silenced, to join with us and stand up for a free press as the unfettered, unbought, Fourth Estate. "Thanks to Manning’s alleged disclosures, we have a sense of what transpired in Iraq and Afghanistan... Thanks to those revelations we now know just how our government leaned on the Vatican to quell opposition to the Iraq War. We now know how Washington pressured the German government to block the prosecution of CIA agents who kidnapped an innocent man, Khaled El-Masri, while he was on vacation. We know how our State Department lobbied hard to prevent a minimum wage increase in Haiti, the hemisphere’s poorest nation." That list of things we know because of Manning and Assange can multiply 100-fold. BOTH OF THEM are now behind bars -- Manning is back in jail for contempt of court for her refusal to testify against Assange about events in 2010. In a democracy, people need to know if their government is interfering and subverting democracies and committing war crimes overseas. 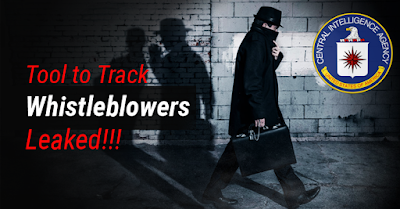 In a democracy, our courts should be busy prosecuting crimes EXPOSED by WikiLeaks, instead of turning the act of revealing them into some sort of crime to persecute and incarcerate the whistle-blower. That's why we, at the Guide, join with Roots Action to take a stand for freedom of the press and transparent government. Join us in asking the government of the United Kingdom NOT to extradite Assange. 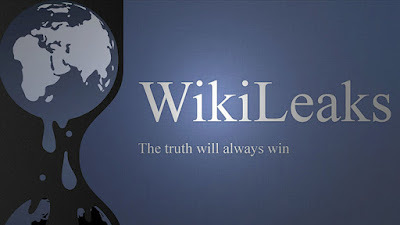 "Do not extradite Julian Assange to the United States. Set him free. He is a publisher. He has informed us about human rights abuses and crimes committed by the U.S. government overseas -- abuses that the U.S. government has tried to keep secret from us." RootsAction is an independent online force endorsed by Jim Hightower, Barbara Ehrenreich, Cornel West, Daniel Ellsberg, Glenn Greenwald, Naomi Klein, Bill Fletcher Jr., Laura Flanders, former U.S. Senator James Abourezk, Frances Fox Piven, Lila Garrett, Phil Donahue, Sonali Kolhatkar, and many others. * The Real News Network: "Daniel Ellsberg On Assange Arrest: The Beginning of the End For Press Freedom"
* Electronic Frontier Foundation: "Statement on Assange Indictment and Arrest"
* Freedom of the Press Foundation: "The Trump administration’s indictment of Julian Assange threatens core press freedom rights"
* David Swanson: "What Bradley Manning Means to Us"
* Juan Cole: "Top 10 Ways Bradley Manning Changed the World"
Each year, Time magazine publishes its choice for the "100 Most Influential People." We want to share a look at one of them. 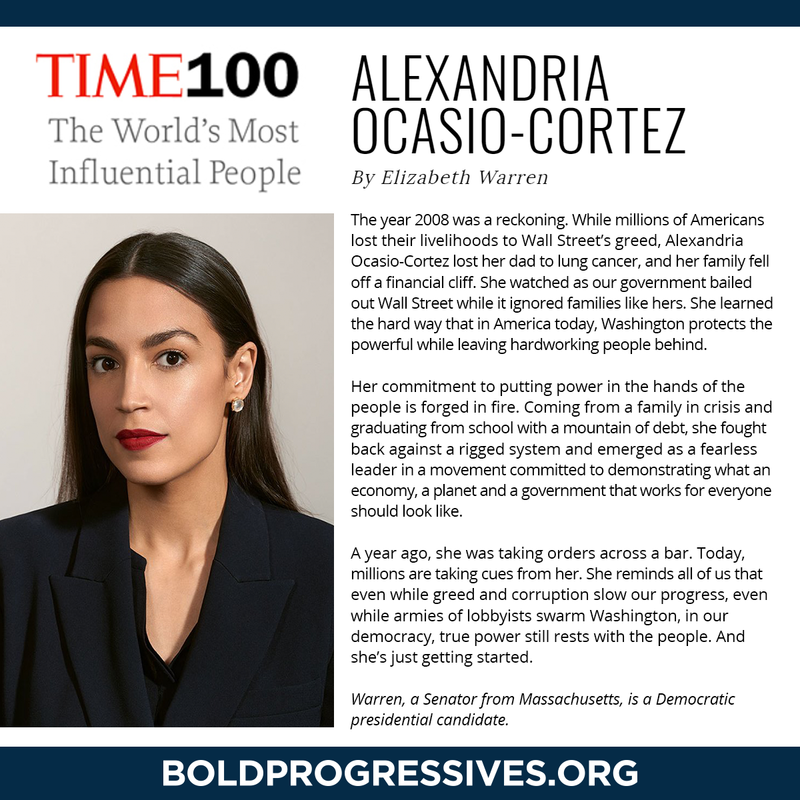 On Wednesday, April 17, Time 100 named AOC -- New York Congresswoman Alexandria Ocasio Cortez -- to their Time 100. And they gave Senator Elizabeth Warren (D, MA) the honor of writing the blurb about AOC. In response, Congresswoman Ocasio-Cortez Tweeted, "Couldn't be more honored and humbled to read these words from a woman I admire so deeply. Thank you, Senator Warren, for your tireless fight for working families." Recently, Alexandria Ocasio-Cortez said, "The majority of Americans are with us on the policies. Americans support Medicare for All, expanding Social Security benefits, gun reform, debt-free college, and a $15 minimum wage. Bold progressive values are popular EVERYWHERE. Together, we have the people. Together, with your help, we’ll have the votes." Congresswoman Ocasio-Cortez has made some tactical errors -- that's to be expected given her comp,ete lack of prior political experience. But she has been on the right side of many issues that matter. She reminds us of a real-life version of Jimmy Stewart's character in "Mr. Smith Goes to Washington," the Frank Capra classic. In that and all her genuine roots in achievement through hard work, she gives us faith that good people do still enter politics, and it need not be a game of thrones played by oligarchs, with the rest of us their pawns. WHAT WILL IT TAKE TO WIN THE DEMOCRATIC NOMINATION? Yes, the 2020 election seems a long way off -- though, for some, it can't get here soon enough. There's s a very old political adage that originated with the labor union movement. It goes like this: "Organize, organize, organize." The Bernie Sanders campaign isn't wasting any time. On April 27, they are holding overba thousand organizing sessions in communities large and small, nationwide. Last go 'round, Bernie Sanders drew record crowds and mobilized young voters in greater numbers than any political candidate, ever, in American history. Yet the Democratic Party Establishment had preordained that Hillary Clinton would be their party's nominee, and they were willing to perform whatever internal string-pulling, deck-stacking, and acts of outright disenfranchisement of Sanders voters that they thought necessary to assure their candidate got the nomination. Thus, when Sanders tells supporters, "This campaign is up against some of the most powerful political and economic institutions in this country," he isn't just taking about Republicans. He is addressing the clout of the comfortable corporatists who buy candidates, office holders, and party agendas to get what they want, across party lines. Sanders continues, "They may have the money, but we have the people – and April 27 is our chance to show what we are capable of when millions of us come together." The gaggle of Democrats vying for the party nomination is unprecedented. A major factor is the assumption that anybody who can wear the mantle of nominee will automatically beat Trump. While that is not a safe bet, at all, no candidate is better equipped than Bernie Sanders to understand just what his opponents are capable of doing. ALL of his opponents. Thus, he's not just running. He's organizing, early. His campaign's message of "Not me, us," is expanding to its potential supporters to say, "By joining an Organizing Kickoff event near you, you’ll be part of the work required to win this election. You’ll also have the opportunity to meet other Bernie supporters in your area." The contact with like-minded-folks card is in play. And a whole lot more that speaks directly to millenials, who now comprise the biggest voting block in the American electorate. The political establishment just might not know what hit 'em. Here's a simplified map of the Sanders organizing sessions on April 27. We'll make this a regular feature, starting in this edition. The idea is to keep important issues in the dialog, when the Big Media Singularity dismisses them. Consumers around the world are spending less on almost everything. Even booze. Shoppers in more than half of 64 countries surveyed said they expect economic conditions to worsen in the coming year. Interesting, because the constitution gives warmarking powers solely to the congress. The measure to end one of our endless wars/endless proxy wars had passed the House on a bipartisan vote of 247-to-175 and was approved by the Senate with the support of seven Republicans. But the latter is not sufficient to override the veto. So expect the record sales of both sophisticated weapons systems and dumb deadly ordnance to continue from the merchants of death of America's warconomy to the brutal regime in Saudi Arabia. RENEWED SABRE-RATTLING WITH NORTH KOREA? The Arbitrary Administration is making a beeline back to “fire and fury” with North Korea — and John “Bomb ‘em” Bolton is egging him on. But there's a chance. South Korean president Moon Jae-in had meetings in D.C. last week, and he brought with him the Korean people’s mandate for peace. Win Without War is a program of the Center for International Policy. "Aldo Leopold’s Land Ethic and the Need for a New Approach to Managing Wildlife"
Absolutely one of the best pieces you can read and share on how humans fail in our attitudes and interactions with wildlife and "managed" wild lands. A late addition here, published Sat, Apr 20 in "CounterPunch." • No terror or political agenda group had yet taken "credit" as of 11 am PDT. • In the US, corporate Big Media is crazy with speculation assuming Muslims did it, and claiming the whole place is rampant with "anti-Christian discrimination and violence," though THAT should be challenged. • Christian churches holding Easter services, and hotels catering to foreign tourists, were the targets. • It does not appear related to the anniversary of the brutal Sri Lankan civil war that ended in a peace settlement ten years ago today. That conflict had seen usually peace-advocating Buddhists fighting with Hindus for control of the country. • Sri Lanka is a poor nation known for its natural beauty, its colorfully vibrant multiethnic culture and its fusion of exciting cuisines. 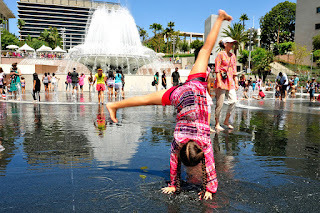 Those things are celebrated in Los Angeles at an annual "Sri Lanka Festival," due in 2019 on Saturday, July 20, in the plaza in front of Pasadena City Hall. 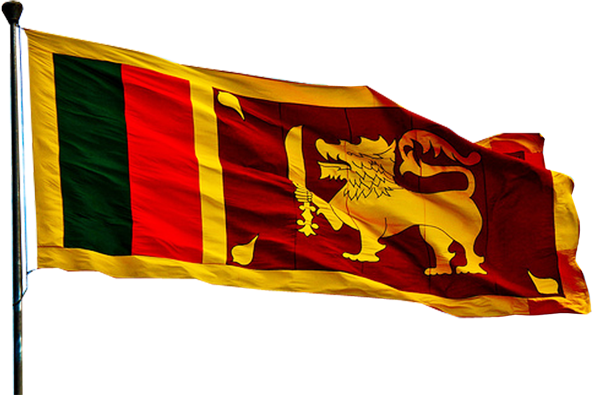 • Sri Lankan expatriots remain proud of their heritage, retaining the moniker of "Lions" of "The Lion Nation." Though that animal is not indigenous to the island, it is their identity, and appears on the national flag. • At home, Sri Lanka became a leader in chosing to promote tourism over destructive exploitation of its forest's exotic varieties of woods. • Tourism is hugely important to its economy. In April, Sri Lanka's government announced free visas for Americans on arrival in the country. Obviously, the terrorist acts that happened today are an existential threat to a tourist economy. Sri Lanka's national banner, the Lion flag. Head on over there for all the EVENTS in our signature annotated calendar. "Hee Haw" voice: "That's all!" Boilerplate? Where's the main pressure gauge? And the firebox? OR USE THE COMMENTS FUNCTION on the Blogspot site. ♪ The ACOUSTIC AMERICANA MUSIC GUIDE endeavors to bring you NEWS – and views of interest to artists everywhere – more specifically to musicians and the creative community and music makers and fans of acoustic and Folk-Americana music. That includes both traditional and innovative forms. From the deepest roots to today’s acoustic renaissance, that’s our beat. We provide a wealth of resources, including a HUGE catalog of acoustic-friendly venues (now undergoing a major update), and inside info on FESTIVALS and select performances in Southern California in venues from the monumentally large to the intimately small and cozy. We cover workshops, conferences, and other events for artists and folks in the music industry, and all kinds o’ things in the world of acoustic and Americana and accessible classical music. From washtub bass to musical spoons to oboe to viola to banjo to squeezebox, from Djangostyle to new-fangled-old-time string band music, from sweet Cajun fiddle to bluegrass and pre-bluegrass Appalachian mountain music to all the swamp water roots of the blues and the bright lights of where the music is headed now. The Acoustic Americana Music Guide. Thanks for sittin' a spell. The cyber porch'll be here anytime you come back from the road.